Description: She is a beautiful elf, with flowing red/gold hair and sparkling green eyes, that sometimes seem shaded with regret. 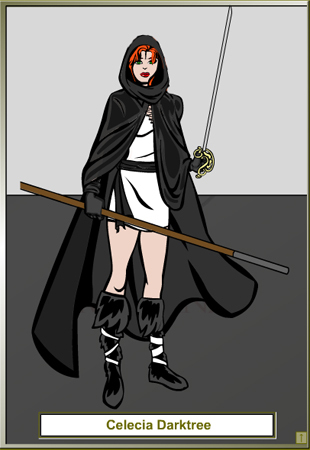 She dresses in fine silks as most elves do, but prefers white and black colors..
History and Personality: Celesia was born in a wood elven village on the northern border of Teer`ess Lean, a raid from skaven resulted in the capture and death of many elves. Celesia was nothing but a apprentice hunter at the time and was taken by the skaven as a slave, she managed to escape when a group of dwarves attacked the skaven hunting party. Though scarred emotionally by her treatment from the skaven, she tried to return home, but found herself hopelessly lost in the wilderness. A druid found the lost elfess and he took her back to the elves, but the wood elves refused to take her back, finding her contaminated with a foul disease created by the rat people. Hurt by the refusal, she did not know true betrayal till she was declared "dark elf" because of the disease. She was sent away with the druid who decided to not abandon the young elf and trained her in his ways, through druidic knowledge's he even found a way to cure that which the skaven inflicted upon her. Angry still with her peoples banishment she stayed in symbayia and fought the evil skaven using her new life as a druid of the woods, never returning Teer`ess Lean, for in truth that would be her death.